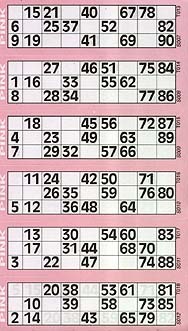 Easy to read, large numbered bordered bingo tickets, easy tear perforations & serial number. 1 Pad contains 600 bingo tickets (6 tickets per page, 100 pages). Approximate ticket size: 120 x 35mm with large 7mm black numbers.